Epoz Aktimate Micro review | What Hi-Fi? Epoz arrived on the desktop speaker scene after a collaboration between Epos, a well known speaker brand in the UK, and an Australian distributor. Hence the Epoz brand name. Dare we say the speakers have clearly had a little more thought devoted to them than the name? A succession of desktop offerings have won us over with simple functionality and brilliant sound quality. The Epoz Aktimate Micro is the company’s best offering yet. The speakers come in the form of a powered ‘master’ speaker and a passive ‘slave’. The former connects to mains power and then to its partner using standard speaker cable (supplied). You’ll find a 3.5mm mini-jack input on the back of the main speaker for connecting any music source, while there’s also a USB input for connecting directly from a computer. On the front of the speaker you’ll find two control knobs, one for power, one for volume. And there’s a trick up the Micro’s sleeve, or more accurately, atop one of the units: an iPod dock. Folding out of sight neatly when not in use, the cabinet opens up to reveal a standard 30-pin Apple dock: fine for all previous generation iPhone and iPod Touch devices, but for the latest-gen (iPhone 5 et al) you’ll need the £25 Lightning adapter – or settle for the 3.5mm input. Despite the name, the Aktimate Micro speakers are at the limits of what we’d call “desktop”. (Although, despite their size, they walked off with our Award for the best desktop speakers last year.) They may not offer much by way of design frills, looking every bit a standard pair of speakers, but the finish is good and the bright red colour (black or white are also available) makes them stand out from the crowd. If you want a pair of desktop speakers on a budget to get the party started, then look no further. The larger cabinets ensure there isn’t another product here that can match the Micros for scale, dynamics or absolute volume. There’s bags of good quality, punchy bass, yet treble details and voices are clean and clear. The larger drivers find it easy to deliver scale alongside subtlety. It’s timing where the Aktimate Micros really score. When it comes to a musical, involving performance, they have no equal in this group. Foals’ Inhaler is an upbeat, dynamic track, and it sounds more entertaining and more articulate here than on any rival: detailed drums and jangly guitars skip along merrily. The dock sounds every bit as good, provided your device isn’t restricted by lower-quality music files. Neatly integrated, it holds any compatible Apple device and works without fuss. So what’s the catch? Well, there isn’t one really. If you want a pair of speakers to sit either side of your laptop, these are a brilliant performance-per-pound option and the best-sounding here. That said, they are on the big side, so won’t be for everyone, while there’s no added flexibility of wireless connectivity. 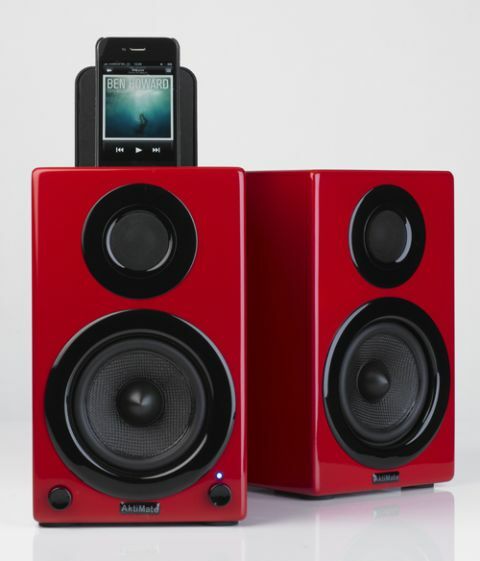 But, provided that doesn’t matter, the Epoz Aktimate Micro speakers need to be near the top of your shortlist.